Organizers may promise an economic boom, but the Games often leave big debts. Greece spent lavishly on the 2004 Athens Games, with final budgets landing billions of dollars in the red. According to a working paper by researchers at Oxford's Saïd Business School, the project went over budget by 60%. Greece also built too many hotel rooms and fell victim to hopes that the Olympics would lead to longer-term gains thanks to tourism. 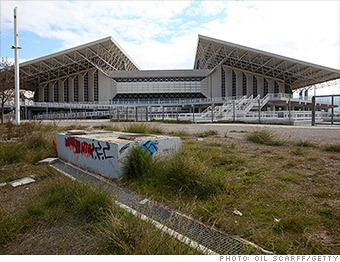 Many of the stadiums built for the Olympics, like the one shown here, now sit unused.